1/7 carat diamonds prong set in a 14K rose gold band forming a true wearable work of art (I-J Color, I2-I3 Clarity). This 14K rose gold band can be worn alone, or accompanied by a complimentary engagement ring. 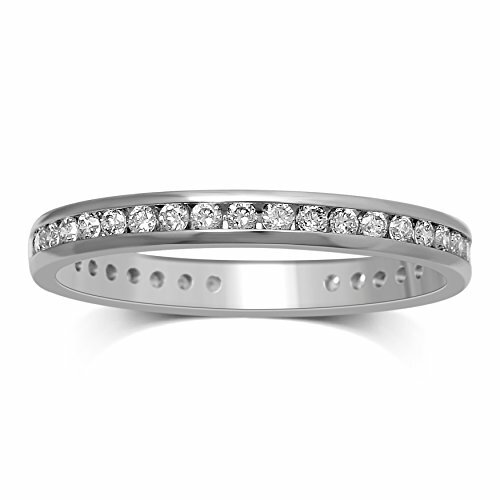 The diamonds in this ring creates a bright glittering look on the finger. This ring is brought to you by Diamond Jewel, an Amazon jewelry brand committed to making a wide array of styles and exact-size, exact-fit jewelry that all have diamonds set inside of them - all of Diamond Jewel's jewelry have a diamond in them. Our high quality jewelry offers only the industry's highest quality diamonds with our experienced buying team working with our suppliers to select timeless styles and create well-crafted and comfortable jewelry. Our team of Gemologists inspect each and every piece for quality craftsmanship and every diamond for cut, color, and clarity to ensure your jewelry will sparkle for generations. For all of Diamond Jewel's rings, we offer exact-size, exact-fit sizes so you can select your particular finger size for the ring, instead of having to make the ring fit a finger based on generic sizing like most other brands offer. This ring comes in a FREE elegant white leatherette ring box with matching white ring pad.